This is absolutely amazing and the best to do. The volcano is beautiful and the views are really special. Pace still works and you can hear it while walking over it. And then afterwards the hot springs is a real threat and the lunch is perfect to. But what really makes the day is Juan Pablo - best and most happy guide ever ! This was a great trip but be aware that the climb is difficult if you have not acclimated to the elevation. If you can't handle the climb, there are people with horses that are available to hire for the climb. The view at the top of the mountain, once you finally get to it, is phenomenal! 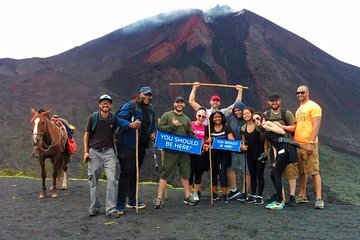 But, don't be fooled, like we were...this tour does not take you to climb the Pacaya Volcano. It is a tour where you climb approx. 7500 ft, which is halfway up a mountain ACROSS from the volcano! The bright is that you actually get to see the Pacaya, which for us, was in eruption that day and we even heard it! It's a pretty steep climb, but of course that depends on what shape you're in...we're in our 50's and pretty athletic, but it still took the breath out of us. And, proper shoes are definitely recommended. I wore a good pair of sneakers, but the rubber kept slipping on the rocks and I almost fell around 5 times, no matter how careful I tried to be! At the beginning of the tour you will be ambushed by locals and their horses, to cheer you down on your climb. They can take you up the mountain, on the horse, if you can't make it for about 25 roundtrip. I recommend to eat breakfast beforehand bc they will not stop and you will need the energy. Also, take the tour out of Antigua if you will be there, bc if you take it from Guatemala City, the bus will drag you all the way to Antigua anyway to pick up other tourists which adds an extra hour, back and forth to your trip!. The final Hot-Springs-pool-circuit, at Teresita's, is totally worth the trip. It will renew and reinvigorate your tired muscles! And, the lunch is very good. No need to bring your own towels. The tour guide we had, Davis, was low key, but pretty knowledgeable. However, once you arrive to the mountain side, a local guide will adhere himself to your group, and you will end up paying him a tip also. Overall, a good experience. If you can make it to the volcano on your own, there are plenty of guides there who you definitely will need, and you can avoid the long trip on the van. This was one of the best things I have ever done...right up there with climbing the Great Wall and diving at the Great Barrier Reef. Our guide, Jovany Mijangos, was patient, knowledgeable and a lifetime local and his English was great. The hike up was challenging at times but you can go at your own pace. There are horses available to 20 to ride up if needed. The views are breathtaking! As you reach the top you are face to face with the clouds! When you reach the top you are on dry lava igneous rock and it looks like another planet. I felt like I was on Mars...so cool!! We even got to roast marshmallows on some of the dry lava that was still hot and smoking. Must do!! The hot springs were not as natural as I thought they would be. It was a spa at a hotel, but it was a beautiful and amazing spa with a delicious lunch...I didn't want to leave. Great afternoon, perfect day! Fascinante, las aguas termanles son una maravilla, es muy bonito. Vayan preparados para caminar, eso sí, se camina un parde horas cuesta arriba. Es un tour solo para gente con buena condición física. I will be honest that I was a bit worried about doing this hike as I'm 50ish and not in great shape, but it was awesome. My friend and I were the only two in the group, and the guide allowed us to take it at our own pace and stop when necessary. You will walk on all types of rocky terrain from sand-like to softball sized rocks. The guide was informative about the volcano and the surrounding area. Finishing off the afternoon in the thermal pools was a relaxing way to end the day. The hike up Pacaya Volcano is quite steep, I would recommend wearing real hiking boots as opposed to sneakers. I was wearing Nikes and kept slipping. They had walking sticks available for 1 and horses that could take you up the volcano for 100 Q one way. Our tour guide Jairo was excellent and very knowledgable. Our driver Jose was very kind and safe. My mother and I did not make it all the way to the top. We decided to turn back about halfway and Jairo insisted that he walk back down with us - even though he didn't have to!! Jose also opened up the van so my other could sit inside with the AC while we waited for the rest of the group. My brother made it to the top and said it was beautiful. The hot springs were a real treat after the volcano although the thermal circuit was a bit different. Definitely a great way to spend our last day in Guatemala!